Percentage, proportion, number and amount are the most common terms used to describe the quantities shown in graphs and charts in Academic Writing Task 1. The percentage of people who read print books decreased. The proportion of people who read e-books was larger/smaller in 2013 than in 2012. The number of people who prefer e-books increased. Teenagers spend a smaller amount on books than older people. For number you must have a plural, countable noun following. Remember also that amount should be used for uncountable nouns. The chart below shows the percentage of total US population aged 65 and over between 1900 and 2000. 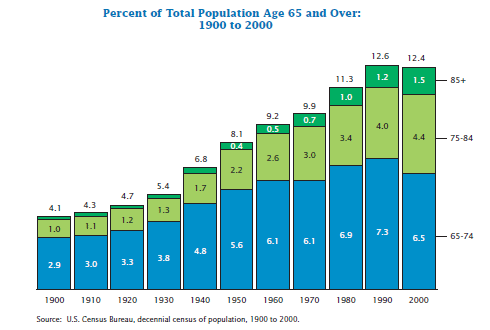 The chart shows the percentage of total population aged 65 and over in the U.S. between 1900 and 2000. In the year 1900 just over 4% of the population was aged over 65. However, by 1960 this figure had doubled. The number of people aged between 75 and 84 remained fairly steady between 1900 and 1930, making up only 1-1.3% of the population. The figure began to rise more significantly in 1940 and by 1970 it had tripled to reach 3% of the population. Although there was no change in the number of people aged 65 -74 between 1960 and 1970, the number of people aged 75 and over increased during this time. By the year 2000, 12.4% of the US population had reached the age of 65 or more, although this was slightly lower than in 1990 when it peaked at 12.6%. The chart shows that today people in the U.S. can expect to live longer than in 1900. By the year 2000 more than 12% of the population had managed to live to the age of 65 and over compared to only 4.1% in 1900.